Longtime voice actor Steve Whitmire was dismissed from the show. 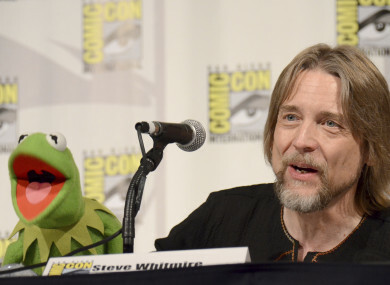 THE MUPPETS SHOW is blaming “unacceptable business conduct” for its dismissal of Steve Whitmire as the longtime performer of Kermit the Frog. This explanation, issued yesterday, follows Whitmire’s emotional blog post last week after his firing was made public. He said he learned last October that the role of Kermit would be recast. Whitmire had been with the Muppets since 1978, and took over as Kermit after the untimely death of Muppets founder Jim Henson in 1990. The Muppets Studio did not detail the nature of Whitmire’s “repeated unacceptable business conduct,” but said it spanned “a period of many years,” adding that “he consistently failed to address” his employers’ feedback. Whitmire could not immediately be reached for comment, but in an interview with The Hollywood Reporter he said the studio felt he had been too outspoken in expressing how the Kermit character should be portrayed on the ABC primetime Muppets mockumentary series that aired in 2015-16. Henson’s daughter and son told The New York Times yesterday that they supported the decision to fire Whitmire. Henson’s daughter, Lisa, told the Times that Whitmire refused to train an understudy for low-level performances and “played brinkmanship very aggressively in contract negotiations”. Lisa Henson is president of the Jim Henson Co., which sold The Muppets brand to Disney in 2004. Brian Henson, who is the company’s chairman, told the Times that Whitmore often sent emails attacking writers, directors and others involved in Muppets projects. Email “There's now a war of words between the voice of Kermit and the makers of the Muppets”. Feedback on “There's now a war of words between the voice of Kermit and the makers of the Muppets”.